It was kind of hard to get out of bed this morning, Adam and I slept in but we managed to get the kids dressed, fed, packed for school and out the door with just enough time to make it to school before the bell. I popped in to the school office to drop some keys off and have a chat to a couple of people, then took Clara to the dog park where she had a wonderful time chasing, being chased and wrestling with Gem (a lovely 1 year old bitzer who has some staffy in her along with who knows what else). What was missing from all this was breakfast. So I came home and cooked myself some brunch. 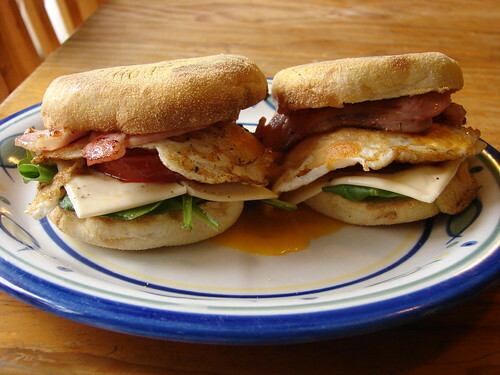 English muffins with baby spinach, low fat cheese slices, grilled tomato, egg and bacon. ‘Twas good. Here via MPJ to check out the Quiz, but I must say that your photo is Yu-u-u-mmy. Now I have a craving.